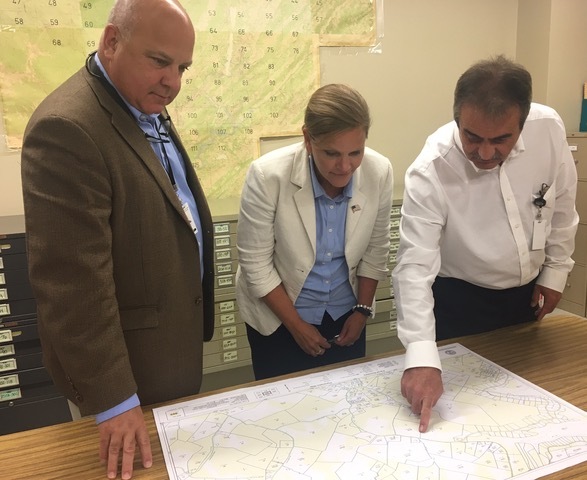 Anderson County Property Assessor Johnny Alley, County Mayor Terry Frank, and Deputy Property Assessor Billy Brown look at some of the areas in the Andersonville area lacking broadband service. Clinton, TN—Anderson County Mayor Terry Frank is asking for interested Anderson County citizens to form a working group in advance of upcoming broadband opportunities made possible by newly passed legislation in Tennessee. Interested individuals are invited to meet on Tuesday, July 11, at 6 p.m.in the conference room at the Anderson County Health Department, 710 N. Main Street in Clinton. Governor Bill Haslam and the Tennessee State Legislature passed the Tennessee Broadband Accessibility Act that provides $45 million over three years in grants and tax credits for service providers to assist in making broadband available to unserved homes and businesses, in addition to allowing non-profit electric cooperatives to provide retail broadband service. Guidance has not yet been released on the grant application process, but Mayor Frank hopes a working group assembled prior to the release of grant guidance could help Anderson County be ready and prepared once grants are released. Frank also hopes the working group will serve as a forum for new ideas regarding connectivity in areas of the county where access is already available. “Numerous residents have written, called or even signed neighborhood petitions letting me know how great the need is for access. For economic, social, health and educational reasons, we need to do all we can to see them connected,” stated Mayor Frank. “I’ve also been contacted by people with access who would like us to be more innovative with the assets we already have. I think a working group on this issue could keep us moving forward,” continued Frank. Rural counties with more households connected to broadband had higher incomes and lower unemployment than those with fewer, according to a 2015 report by researchers Brian Whitacre of Oklahoma State University, Roberto Gallardo of Mississippi State University, and Sharon Strover of the University of Texas. Tennessee’s Department of Economic and Community Development (TNECD) identified broadband as a crucial factor in the economic success of their communities and commissioned a broadband study to assess the current state of broadband in Tennessee. That report showed Anderson County ranking well in terms of connectivity; however, Anderson County still has several areas in our county where homes and businesses are unserved. For questions or additional information, contact Mayor Frank at 457-6200 or via email at tfrank@andersontn.org. This is a wonderful opportunity for Anderson County and we must be ready. Well, I think to make investments for broadband and to make the internet access powerful are essential for economic growth. Thanks for sharing this information. This is quite awesome because households who do not have internet service will now have access to the internet and they will be able to connect and communicate with their loved ones whenever they wish to. And more importantly, they will have access to unlimited knowledge and information that they can read and use 24/7.